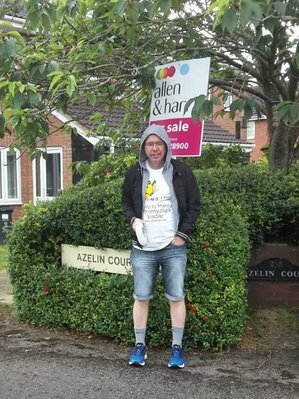 Nigel Tucker cycled 100km in New Forest on the 16th September to support FMA UK and to raise awareness of fibromyalgia. 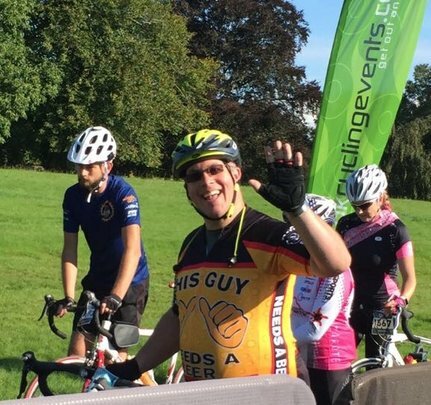 Nigel told us: ‘’Yesterday was the big day, I completed my 61 mile/100km bike ride in 4hours and 6 minutes which was fast enough to earn me a silver time in the event, just 10 minutes and 55 seconds short of gold. The fibromyalgia cause is close to my heart because one of my closest friends lives with the condition every day – she was diagnosed 5 years ago. 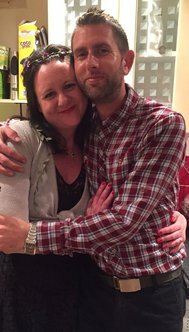 I chose Fibromyalgia Action UK from the JustGiving website as I want to help raise awareness and support the great work you do in helping people like my best friend. Whilst I am a keen cyclist I have never done more than around 60km in any one day so 100km is a big push for me.’’ Nigel has been training hard before the event, cycling a lot and up to 100km a week before the event. I trained for 8 weeks in the run up to the walk for two days a week, starting from a hour and a half of sustained walking and building up to three and a half hours - in my last bit of training I reached 8.2 miles walked. My girlfriend supported me by coming along on some of the training. On the day of the walk, my brother came along to support me in his car, and drove to certain points to check I was alright and supply me with bananas and drinks along the way. We would like to say well done to Matthew! Take a selfie and post it on social media using the hashtag #FightFibro. We’ll be sharing them throughout the week! Fundraise for Fibromyalgia Action UK. Please visit: http://www.fmauk.org/fundraising for more information. Lynsey Read-Edwards from Norfolk together with her husband Paul will walk 14 km from Dale Head to Catbells in Lake District on 23 September for FMA UK with the aim of raising £1,000. She has already raised £760. Lynsey told us: ‘’I wish to complete the challenge and raise awareness for Fibromyalgia Action UK because I wish to help fellow sufferers. I feel it is important to speak honestly in order to raise awareness and hopefully raise some money to donate towards a cause very close to my heart. Fibromyalgia is difficult to explain but it does effect every aspect of your life and for me it was life changing. It took away my Independence and isolated me from the world. The condition hit my life like a nasty flu bug. It zapped all of my energy & strength. I was not independent. I couldn't walk anywhere without support. Those early days were the hardest thing I have ever experienced. This stage of my fibromyalgia lasted for about two years. And after that every year I have been able to do more and more with the hope of one day being able to be more active and more able. "I was diagnosed when I was 15 (2012)- at this time in my life I was practically immobile. I was forced out of school. I had to force and push to get this diagnosis, I had been discharged and then referred and that process was repeated and FINALLY I was told that my chronic pain, my tiredness, depression, anxiety, ibs. It was all linked. I've been through several medication changes, my weight has fluctuated massively. Self acceptance was probably the hardest part of my diagnosis. With medication, check ups every 6 months, I am now mobile. I will not let my disability define me, I am stronger than that. So I started competing in 2013, when I won the title of Sheppey Princess. I then has a serious ankle injury, which led me to take a break for two years. I've then gone on to compete in charity pageants. But I came back on a national stage again in 2016 as Miss Kent Curve. I placed top 5, won congeniality and publicity award. I've then gone on to compete again and placed first runner up! Won top Top Model! I am now competing in Miss Voluptuous UK, for my chance to be there first UK queen. This is a platform based competition and Miss Voluptuous directors pride themselves on their girls charity work. So here I am! " GOOD LUCK ...and be sure to let us know how you get on. 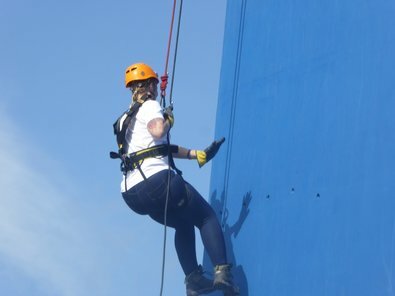 Hayley Kenward together with three friends raised over £1,000 by abseiling 100 metres down the Spinnaker Tower on the 12th August to raise funds for FMA UK because her partner, Michelle, lives with fibromyalgia. The Emirates Spinnaker Tower is an iconic building soaring 560 foot (170 m) above Portsmouth Harbour and the Solent. It is taller than the London Eye, Blackpool Tower and Big Ben and has already established itself as a national icon for Britain.